Galway is set to become the second Irish city with a bike sharing scheme as its university gears up to run one ahead of the planned regional rental systems. NUI Galway confirmed last week that it is to launch a UK-designed service on its campus that uses conventional bicycle stands rather than bulky DublinBikes-like docking stations and terminals. A spokeswoman for the university said that registration will be only opened to students and staff at first but that it ‘may’ be widened to the general public after launch. The scheme, titled ‘Spin’, is to be trialled “in the coming weeks” with the aim of starting it at the start of the new academic year in September. 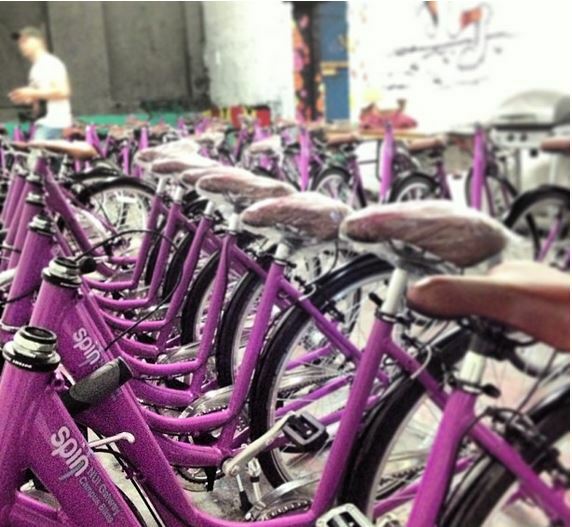 Spin will have 45 bicycles and nine drop-off locations – the university already has permission to locate extra locations off-campus but expansion depends on how successful it is. “This is an NUI Galway funded initiative in the pilot period of one year. It is hoped that revenues will largely fund the scheme as a going concern and there is also scope for advertising revenue on the mudguards of the bikes,” said Michelle Ní Chróinín, press officer at NUI Galway. Registration will be €10 and – as with DublinBikes – the first half-hour is free. After that it scales up from €0.50 up to an hour, €6.50 for 3 to 4 hours, and €2.00 per half hour beyond four hours [prices updated since story first published]. Bikes will be available to rent 24 hours a day. Spin is designed and to be run by UK-based Grand Scheme, who were chosen after a tendering process. Grand Scheme runs Newcastle’s ScratchBikes – which was set up around Newcastle University then expanded across the city with the support of the city’s business improvement district company. The company also recently launched schemes in Oxford and Sunderland. “Spin is perfectly suited to a ‘community bike share’, where significant businesses can sponsor stations and put them up around the city,” said Michelle Ní Chróinín, press officer at NUI Galway. DublinBikes, and similar systems in London, Paris and New York, work using expensive docking stations and terminals, but Grand Scheme says its own design is cheaper to provide because it works using standard bicycle stands with the rental technology built into the bicycles. Users signup online to get an access code which unlocks a key from the bicycles. The key is used to unlock the bicycle and lock it again at a designated stand when finished – on-board GPS tracks the bicycles and correct locations. The nine stations across the NUI campus are to be located from just north of the Galway Cathedral, to beyond the main campus at the park and ride beside the NUI Galway Sports Pavilion. “Initially we will limit the stations to the campus, but we already have permission to place additional stands on the [Galway University] hospital grounds and in some other areas around the city in conjunction with Galway City Council. It will depend on the success of the system in the initial period,” said Ní Chróinín. Spin is separate to the planned regional city bike share schemes for Cork, Galway, Limerick and Waterford being promoted by the National Transport Authority. That tendering process is at the pre-qualification stage – the companies selected are expected to provide submissions detailing their bids to run the schemes before the end of September.